Shirobako is set in an anime studio, giving viewers an inside (and often, clever) look at how anime is made. Many of the characters are inspired by folks working in animation. Which makes sense! If this is going to be an insider’s look at anime, then it should be filled with insiders, no? The likenesses have been pointed out before (here, Twitter user Yebi_Fly noticed last fall). More recently, Twitter user Gundam_TV created an exhaustive comparison. Let’s have a look! Anime director Seiji Mizushima has helmed shows like Fullmetal Alchemist and Mobile Suit Gundam 00. A long-time industry vet, Masao Murayama co-founded anime studio Madhouse. He now heads up a new studio called MAPPA. Yoshikazu Iwanami is a sound director who has worked on an array of anime, including Blood-C, Ghost in the Shell: Arise, JoJo’s Bizarre Adventure, and many more. Hideaki Anno is probably best known for Neon Genesis Evangelion. Currently, he is working on the new Godzilla movie. Masahiko Minami started at Sunrise, but went on to co-found Bones. Mai Nakahara is a voice actor who might be best known for voicing Nagisa in Clannad. Shizuka Ito is prolific voice actor. More recently, she’s been recording music. Likewise, Ai Kayano is another voice actor and singer. Shiro Hamaguchi is a composer, who has scored the One Piece anime and, more recently, Shirobako. He’s also done arrangements for Final Fantasy VII and Monster Hunter. Hirokazu Hamamura was previously the Editor-in-Chief of game mag Famitsu. He is now the president of the magazine’s parent company, Enterbrain. Naoyuki Onda is an anime vet with a long list of credits and a buff look. Yuji Matsukura has produced anime Azumanga Daioh, Bakuman, and Ikki Tousen—among, many, many others. Here is Yuta Todoroki, an anime producer who previously worked at Bandai Namco. Takeshi Nogami is a manga artist. Takashi Ikebata has worked as a storyboard artist and an anime director. 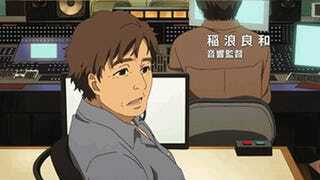 Hiroyuki Yoshino is a screenwriter with credits like My-HiME. Masayuki Yoshihara is an anime vet with credits on everything from Ghost in the Shell: Stand Alone Complex to Crayon Shin-chan. Mitsuhisa Ishikawa co-founded Production I.G and oversaw Kill Bill’s anime sequence.